I was dispatched to Chester Square SW1, to take stills during filming for the 1993 documentary ‘Thatcher the Downing Street Years,’ so that we would have BBC copyright production images for publicity. 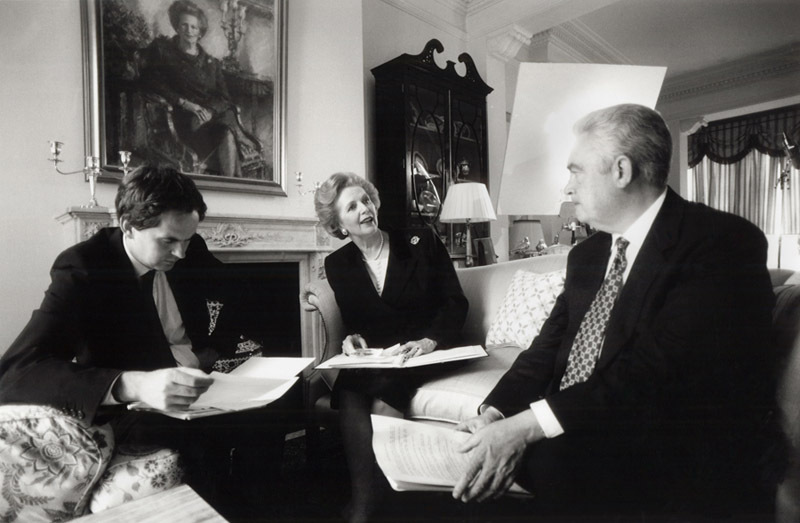 It was an independent production (Blakeway Prods) - producers Denys Blakeway and Hugh Scully (one time presesenter of Antiques Roadshow) are pictured with Thatcher in her sitting room just before filming started. The series was timed to coincide with the publication of her autobiography of the same title. In my photo she has the manuscript (at that time unpublished and much anticipated) on her lap. She was rehearsing what she was about to say on camera, as I took this frame my ears pricked up to hear her exclaim “Geoffrey Howe, ….. Bile and treachery!…no I’m going to save treachery for the Cabinet”.